It goes without saying that teachers everywhere are on a tight budget. We are here to give you some great ideas for craft projects that can be done on a budget using recycled materials or repurposing. School supply organizers will be covered in this article. Check back soon for some recycled art project ideas. First, we will tackle some cool school tools to help you and your students get organized, made from recycled materials and repurposing other products. Wallpaper or craft paper is used to cover this old tool box, making it look brand new again. 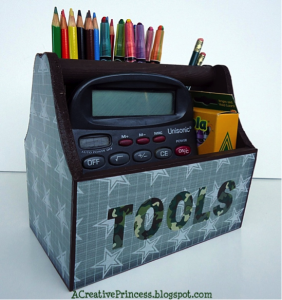 It is repurposed to make a great school room supply organizer. Each child can customize their own with their name and individual design choices. An organizer like this holds and neatly arranges a great deal of school supplies. A great project for the beginning of the school year to ease into school work and to get to know each child’s style, likes, and capabilities. This is a creative school tool organization project that can work well for kids of all ages. Older children can express their creativity and style with this project just as well as a younger child can. Can you spot the recycled materials? All of the boxes are made from recycled cereal and food boxes; all of the pencil holders are made with toilet paper and paper towel rolls! Just choose craft paper, wrapping paper, or wall paper to cover the cardboard. The thicker paper choices can also reinforce the cardboard to make it last longer. 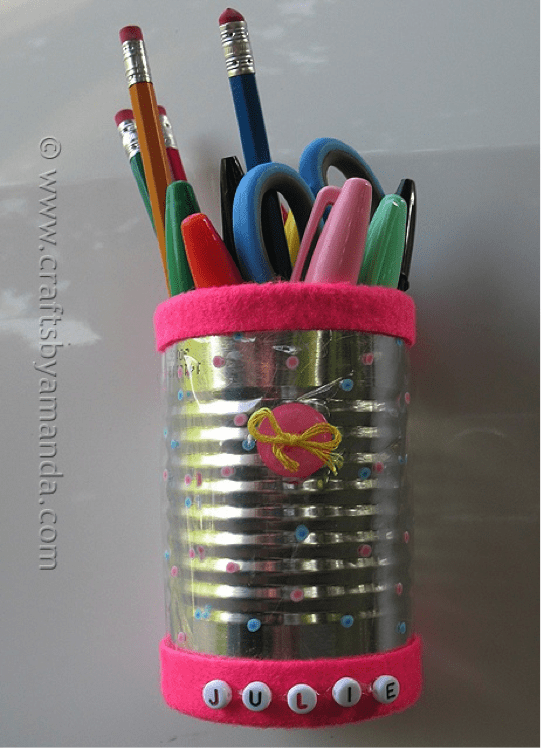 This can also give students the idea to make a supply organizer set for home too, a gift for their parent’s work desks, and more. 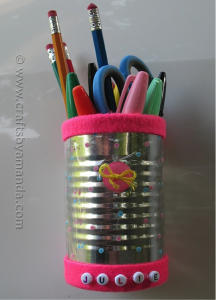 This is yet another fun craft project to take on with your students where their creativity can flow. This old can gets a brand new look and is magnetic! A wonderful space saver and will also be able to work with students who need extra organization in their lockers. The possibilities are endless for the design possibilities. They can be customized with beads, paint, or even magnetic letters. 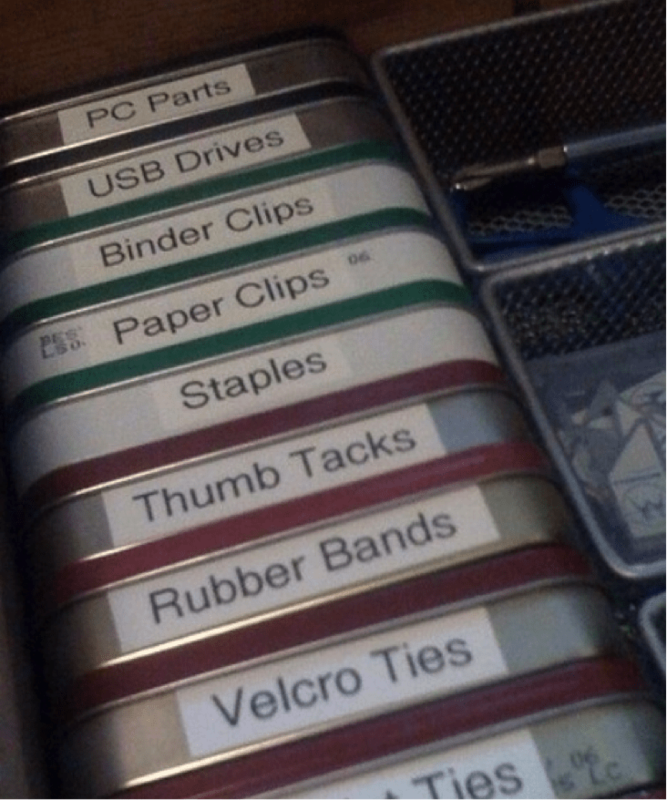 At home, students can also use these holders for multiple organization tasks, especially in the bathroom for Q-tips, tooth brushes, jewelry, hair ties, and more. Bio: Amanda Greene is author and Brand Manager for RHL dorm bedding. She enjoys writing about education topics and ideas.